This recipe is my latest McCormick partnership creation; I’ve been getting a little tired of my standard balsamic vinaigrette and decided it was time to try something new. And this is the result! A sneakily veggie-packed salad dressing that is super easy to make and perfect for summer. Great way to enjoy the abundance of fresh produce available right now, too! The secret ingredient giving this dressing some nice creaminess is pureed cauliflower, so while it’s creamy, it’s not too thick or heavy. 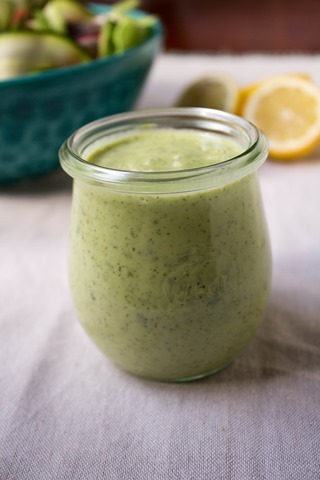 The lemon gives it a nice bit of tang and acidity, and the combination of herbs lends brightness, a more intense flavor, and a pretty color, too. I really love dried dill in particular – anyone else? As per usual, this recipe comes together quickly! 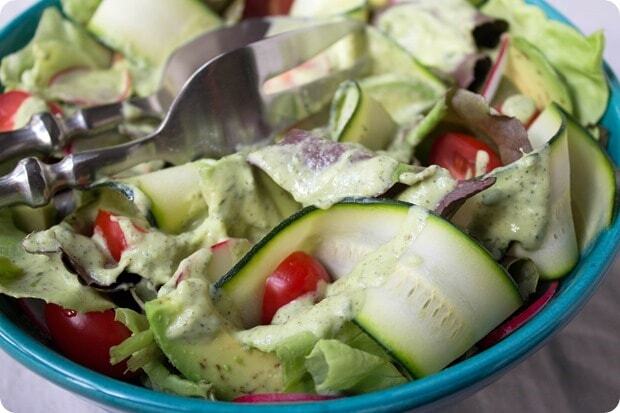 Just put all the ingredients in a blender, blend, and then pour over your favorite salad. Boom. Here’s the recipe. I hope you enjoy it, too! 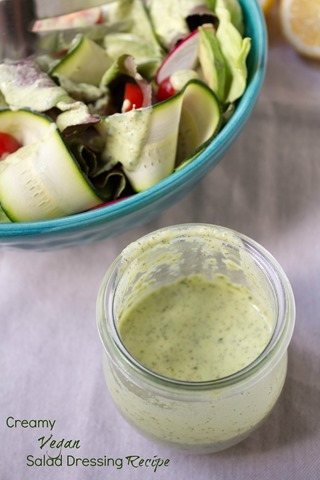 Perfect for summer, this vegan salad dressing is creamy but not too thick or heavy. Vegan, too - the creaminess comes from cauliflower, so you get a bonus veggie boost! 2. 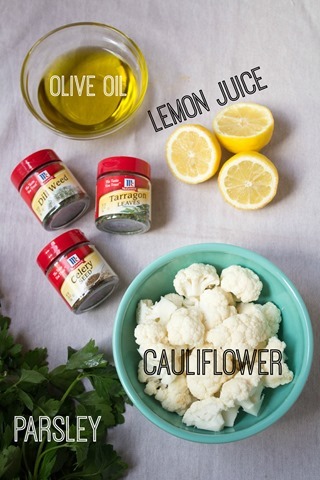 Combine the cauliflower, olive oil, lemon juice, dill, tarragon, celery seed, and parsley in a blender. Blend until smooth. Season to taste with salt and pepper. Thank you to McCormick for sponsoring this post! For some more creative, delicious recipes utilizing fresh summer produce, check out their website. I’m eyeing the Roasted Beet and White Bean Dip (sounds sooo good) and the Kale, Bacon & Pistachio Pasta! What’s your favorite unexpected way to use pureed veggies in a recipe? Previous article: Trying Something New: SUP Yoga at Key Bridge Boathouse! This is genius! 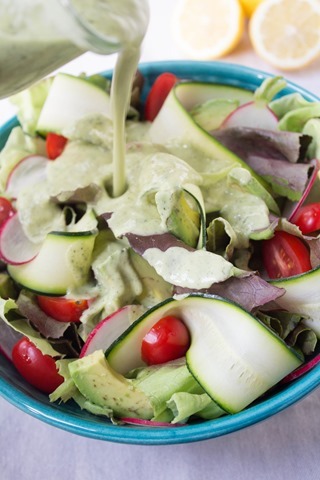 I usually use avocado and herbs to make a creamy dressing. I’ll definitely have to give this recipe a try! Avocado is always a win, too! Yum! Cauliflower! Would have never thought of that. Cool. I have a smilier recipe I use, but I love the use of the 3 dried herbs! Can’t wait to test this out on my next salad! Yum! This sounds delicious! I love new ways to update a salad! Love that you used cauliflower! Looks tasty! I love making my own salad dressings. As someone else said, YUM!!! LOVE the idea of using cauliflower. Thanks for herb suggestions. Your photos are very mouth-watering and always make the food extremely appealing. I enjoy your artistry in photography, and the friendly fonts of your blog which make it so easy and fun to read and digest. Some bloggers are very off-putting with their fonts and set-up so it is really a chore and painful to try to read. Yours invites people in, and nourishes, and is the perfect expression of who you are…playful, spontaneous, creative, brilliant, caring, fun, nurturing, loving, honest, wonderful use of words (wordsmithing) and making complicated things easy! Thank you for sharing your life, adventures and challenges in such a joyful and inspiring way. I always look forward to reading your blog and feel good from the positive energy of it. 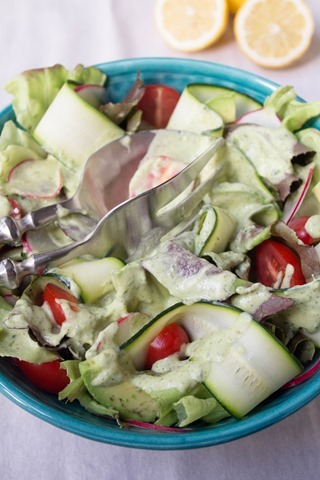 This looks delicious – perfect for Summer! It seems that cauliflower would make a good base for vegan Caesar dressing as well. Just checking my emails and come upon a picture that looks really familiar. It was you in my Speedy Scoop! Yeah! So nice of them to feature my blog post about nutrition for runners! Creamy Vegan salad look really tasty!